What are Progressive Rewards Bonuses? As part of the Rewards Program, every time you play any game at BingoMania you will earn both experience points (XPs) to increase your star level AND you will unlock progressive rewards. These are the cash and bonus rewards! Remember, the higher your Star Level the BIGGER your progressive rewards will be. So make sure to Level up! What does Unlocking Funding Bonuses mean? As you play, you’ll unlock Funding Bonus Rewards that increase your daily & special funding bonuses. For example, when you unlock 2 x 10% funding bonus, you will get 120% to 220% on regular days and 120% to 320% on special bonus days! Within each tier, you have at least 6 x progressive funding bonus rewards. When you unlock instant cash or instant bonuses, you will automatically receive the unlocked amount in your BingoMania account. 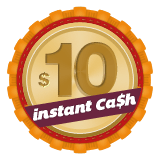 Within each tier, you have at least 6 x instant cash rewards and 6 x instant bonus rewards. Scroll the carousel above to see all the great rewards you can unlock in your current tier. Playing our new slots will not contribute towards unlocking your progressive rewards. Making a withdrawal will reduce your unlocked funding bonuses down to the base amount of 100%. Making a withdrawal will reset your progressive rewards back to the beginning. The order, amounts and the requirements to unlock progressive rewards is subject to change without prior notice. All players are automatically opted in to the rewards program with upon making their first deposit. The rewards program is an added perk for playing at BingoMania. Therefore, management reserves the right to remove any player from the rewards program.